Very well-composed writeup! I was simply blown away by the Baker/baker example. As a kid, I had a hard time remembering the emergency numbers for the fire rescue (101) and ambulance(102) in India. I would invariably get them mixed up. So, one day I decided enough was enough and figured a way to remember them: When would I call an ambulance? Only when I see someone about to die in the fire right? So fire came first, then ambulance. I know it seems silly now, and it was probably the original reason behind these numbers, but as a kid, I felt like I cracked something huge when I hit upon this! Thanks Aparna! Actually your idea is along similar lines. Well done. That is so sweet an example! Wonderful things rarely make sense. They make good stories though. Your breakthrough..what a feeling. It’s not that I forget where my keys are, it’s that they move when I’m not looking. What are we going to do about that? However does the principle of learning such skills (read as memo learning skill) generically applicable to one and all? I ask this because if it can be mastered in a way then an Alzheimer’s patient can be taught to remember his meds next time around. The point I try to make is that memory also depends on not only being able to master it by working your grey matter but also on the amount of that matter you have (crudely speaking, degeneration cannot be reversed with a mastery). Good question. These methods have helped people whose memories have been wiped out by accidents or trauma. As for memory depending on the amount of matter one has, be that as it may, we don’t know the true limits on human memory. I for one had no idea that a person could memorize 1400 random binary digits in 30 minutes. Clearly, the limits of human memory—after applying these clever ideas—aren’t yet known. I think that the record is 4000-something binaries in 30 minutes. I saw someone do 3620 in 30 min at the UK competition. You can learn to memorize 60 random binary digits in just a few min here. No experience necessary. Binary digits are easier to memorize than decimal. To me, all these feats seem phenomenal. I will check out the link you’ve given. Thanks. Haha! I’m gonna try this too. I feel like I have early-onset Alzheimers. Now that they’re saying it’s another type of diabetes, I must remember to lay off the candy to remember other things well. I like the idea — and the image — of a memory palace. Nice post! BTW the idea of a memory palace came from the apocryphal story of a poet, Simonides of Ceos. I didn’t want to load the post with that story, but you can check it out on wiki if you want. Very cool, B. I do believe many of our time-saving gadgets are reducing our memory skills to nada. And that’s not good. Great post. I can remember where I put my keys as long as put them in the exact same spot every single time. As far as making speeches, I could do that — memory — pretty good at that — it’s the heart-pounding anxious panic attacks I experience when having to speak in front of people that I need to work on. ;). I’m always forgetting where I put things and, yes, I put my keys in a bowl or I would lose them. I do speeches well if I’m allowed to ad-lib and to carry a crib-sheet with key points. As for the panic attacks, those are resolved only by speaking in public more and more. Fascinating post. I’m currently taking a full course load and it’s all medical classes. I have to memorize hundreds of new bits of info and medical terms every week. I just had my anatomy lab exam and I use tricks to help jog my memory. And the more ridiculous, the more I can remember. Like coxal. Cox-reminds me of Courtney Cox on Friends. She danced with Bruce Springstein and moved her hips. Coxal=hip. Once that memory association is stuck in my brain, it’s there forever. Nice association! You’ll never forget coxal now. And you’re right, some courses just require you to learn and know a lot of facts, and it’s best to rely on such methods. I guess feigned contextual learning is the next best thing to conceptual learning! It is a fact .Memory was relative ,in the past people related events to remember dates.Like birth of a child or a wedding ,a celebration in the family was bundled together in the mind and random access brought forth the dates to the person.But the post is very correct, with the new gadgets available storage in the same has made the brains lose some of its abilities to remember. True. Because we remember things associated with emotions, it’s best to create an emotional attachment to whatever it is we need to remember. Thanks for visiting and commenting! Great post! I think we all use instinctive techniques to remember things – e.g. dates as someone pointed out. And it’s also true that the more we do it the better we get at it. The brain is ‘plastic’ so if you lose one set of connections or pathways you can create new ones. Or if a particular memory has multiple connections linking to it already then the loss of a few doesn’t matter as much. You’re right; practice seems to be the only true way of getting at it. And you make an interesting point—if a particular memory has many connections, the loss of a few won’t matter so much. Thanks Bharat. My Dad had mild dementia for many years before he died, so as his carer I was motivated to look into the whole memory loss problem. Repetition was one of the strategies we used and it did work. Nice. This is my answer when people point out the seeming uselessness of these methods in the age of the internet—it is by such exercises that we can hope to explore the connection between brain physiology and memory. Same here. This is not the first time I’ve heard of something like this. I feel I’m just not the kind of person who will apply himself and do this properly. People like me gape at such feats—that’s it. Aw hell, maybe I’ll try memorizing a deck of cards someday! I have always had to use memory tricks. When sat for the PMP exam a few years ago and had to remember several formulas, ultimately I put them into dance steps that made sense to me. I danced all my life so I used Latin dances for each of the formulas. It worked, I didn’t forget a single formula and passed that section of the exam. That’s brilliant. I guess because you’re interested in dance, those associations would be second nature to you, and you wouldn’t forget anything. But I must confess, it’s one of the most interesting practical use of these techniques I’ve heard! Love it when I get pointed in to the right Ted. It connected dots of mindfulness for me. For this, I am truly grateful. You are doing your “job” as a blogger. Thanks! Joshua’s speech is interesting and funny. 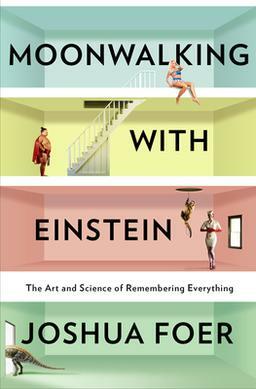 Pingback: Joshua Foer: How to Improve Your Memory | What is psychology? I think I saw this guy on The Daily Show. It reminds me of one of my favorite mnemonics – stolen from an Eighties’ sitcom, the name of which escapes me. In order to remember that AU is the chemical symbol for gold, I think “A U, you just stole my gold watch.” That’s all I got, man. Have missed you! BTW, was talking you up at a writing gig I attended and was telling everyone what a great editor you are. Thinking you should consider editing professionally. I’ve always found mnemonics amazing. They help us commit chains of details into memory without causal relation. What have you been up to? You’re posting after a long time. How’s your novel going on? Thanks for talking me up so much! As for professional editing, maybe, someday. But right now, I’m bogged down under my lab and related work. Hope to write something soon. Just took some time off. Had lots of condo organizing and family stuff to take care of. Back to work. Getting back to my novel rewrite today. Got great feedback on my first page from a well-known writer and critique master. Hope you’re work is going well. Sorry to have just fallen off the planet like that. You’ll have to friend me on FB (the real me) and we can stay in touch more easily. Not gonna be on the net often for a month or so. Am in India! Will check out your blog though. Yay! Well, there’s an excellent reason not to be online much. I would LOVE to go to India one day. Hope you have a wonderful trip. Are you visiting with family or is it just a pleasure trip? I really need to do this more. I let so much slip out of my mind, it’s crazy. I always think, “Oh, I can look it up” or “I can write it down,” but for those times I can’t, I should use some of these tips. I’m sure you’ll find it useful. It’s hard work, though. I’m unable to find the guts to try it!